Maa Brahmacharini, the second Avatar of Maa Durga is worshiped on the second day of Navratri. She is the ocean of wisdom & knowledge and an epitome of spiritual enlightenment. Worship Brahmacharini with pure heart and attain peace of mind. Today is the second day of Navratri. 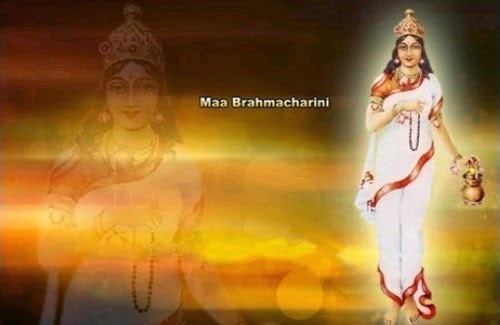 This day is dedicate to Maa Brahmacharini the second form of Goddess Durga. Let’s discuss the goddess of the day along with the rituals. Devi Brahmacharini is the goddess of knowledge & wisdom and the ruler of planet, Mars. Maa Brahmacharini is often symbolized as the Devi who performs penance (Tapasya). The appearance of the goddess is divine with solar radiations behind her head. She wears a white saree and adorns Rudraksha, as her ornament. Brahmacharini is worshiped by the Rishi-Munis, saints and sages. The goddess has four hands, out of which two hands carry weapons. In one hand, she holds Rudraksha Mala (rosary) and from one hand she blesses her devotees. Her Vahana (vehicle) is a sacred crow. Follow these simple rituals to honor the second Avatar (manifestation) of Maa Durga and seek her blessings for yourself and for your family. We wish you a Happy Navratri! Today is Sant Jhulelal Jayanti. Sant Jhulelal is the Lord of Sindhi Community. His birthday is popularly known as Cheti Chand. Also, today is Fool’s Day. It is April 1, the day to play some funny pranks with friends and family. Don’t forget to enjoy the fun and laughter of today.